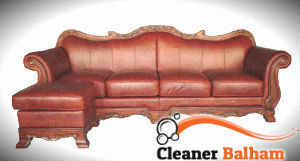 Are you looking for help with your leather sofa and other leather furniture cleaning and maintenance. Our company is offering you a helping hand with it. We are a cleaning services provider and we have the skills and knowledge on how to perfectly clean, deodorise and care for all of the different types of leather furniture. 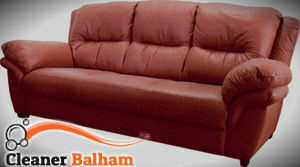 If you live in Balham, call us now and enjoy our perfect and reasonably priced leather sofa cleaning service. Our cleaners will clean and moisturise your leather, which will help prolong its life. In time leather can dry and even crack which makes it an eyesore. Hire our professional leather sofa cleaning service and let us make your investment worth its while. We guarantee you outstanding results. You do not have to worry about who is going to take care of your leather furniture. Hire us, and our cleaners will be in charge of their cleaning and maintenance. Our cleaners can clean efficiently all types of leather – pigmented, suede, aniline, etc. We have equipped them with all of the latest non-harmful leather cleaning products and conditioners. We assure you that no matter what kind of leather your furniture upholstery is, our cleaners will properly take care of it. Call us now for the most perfect and reasonably priced leather sofa cleaning service available in Balham, SW12. We have the most experienced cleaners and the most fair prices. We guarantee you 100% efficiency and satisfaction with our cleaners’ work. Take advantage of our one-of-a-kind offer.